Though many have raved about this interactive playset, Fisher Price discontinued it. We suggest an alternative in our review. A large playset is able to hold the weight of small children as they use it to pull themselves into a standing position. Short songs, blinking lights, and a few ball ramps usually hold children’s attention for a time. We’ve found that while most children really take to it, some kids just don’t show any interest at all. 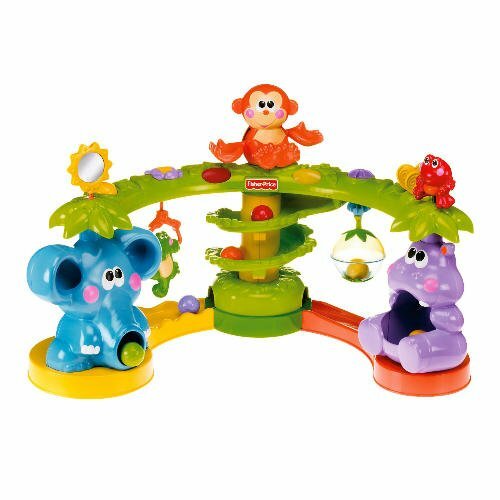 Fisher Price has discontinued this playset. If you’re looking for a sturdy playset for new walkers with music and lights, take a look at their Bright Beats Play Space. If you know of the perfect toy alternative for this playset, let us know at info@theguidefortoys.com! The monkey perched atop the toy can hold balls in his two hands, and will drop a ball down the ramp from his left hand. Both the swinging alligator and the hanging fruit will trigger songs and lights. The hippo and elephant sitting on the ends have hollow spaces where balls can be stored. A sun and frog are attached by springs to either end of the toy, and seem to be fun for small children to chew on. Assorted moveable objects adorn the playset, with some making clicking noises and others acting like a rattle. Playset includes pieces to assemble and six plastic balls. Requires a Phillips screwdriver for assembly. Stands about 2 ½ feet tall. 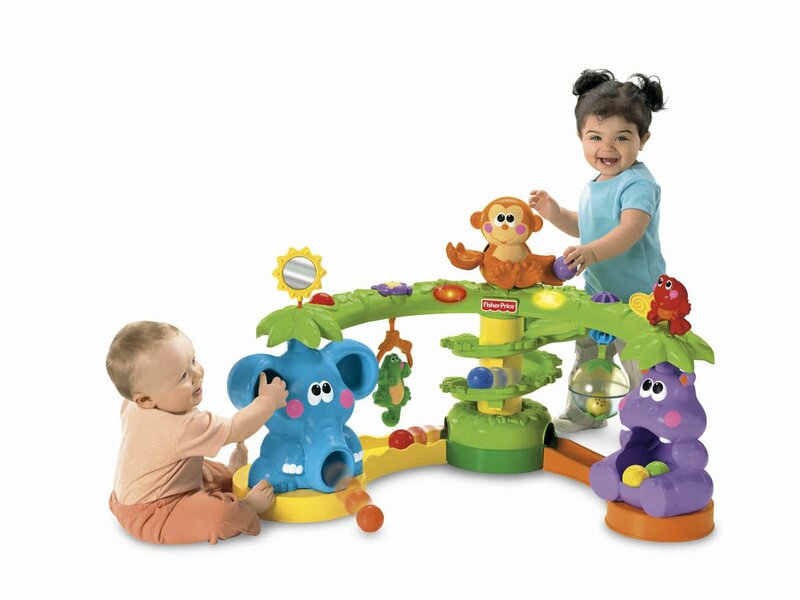 Able to support the weight of a toddler, many kids use the toy to help them stand as they explore what all the playset can do. Most kids really seem to enjoy this playset. With that said, there are a small number that just don’t take to it, and that’s a chance taken with every toy. We are unable to account for why some kids love it while others don’t’ care at all, so we can’t really give any advice on how to predict which kiddos will prefer this toy. Again, most kids do like it, but some just don’t. The pieces are large, so assembly is fairly quick. However, some of the parts snap together and may require a substantial amount of force to pop them in. There are also reports of some pieces not fitting together exactly. This does not affect the playset’s function, though it may create a few corners or spaces where curious fingers could get a small pinch. The green leaves above the hippo are not sharp, though they might cause bruising or scrapes if fallen onto. Children who don’t quite have the hang of standing should be monitored while using this playset. Assembly is not always the easiest with this toy, and some users find that the parts don’t fit together correctly. A few users have mentioned pinching their fingers during assembly, though we have not found any reports of serious injury. Once assembled, the playset is not designed to be taken apart again for storage or transportation. For more information on how to clean toys, check out our Guide to Cleaning Toys. Requires 3 AA Batteries for lights and sounds. A few instances of children bruising themselves on the hippo’s leaves have occurred, but we have not found reports of any serious injury.